It wasn’t the roads or flood-ravaged homes that proved hardest to repair in Bethel. A year after Tropical Storm Irene pummeled this town of 2030 residents, the signs of recovery are remarkable: Down on hard-hit River Street, visitors can hear the hum of construction crews overhauling homes gutted by the rising White River. 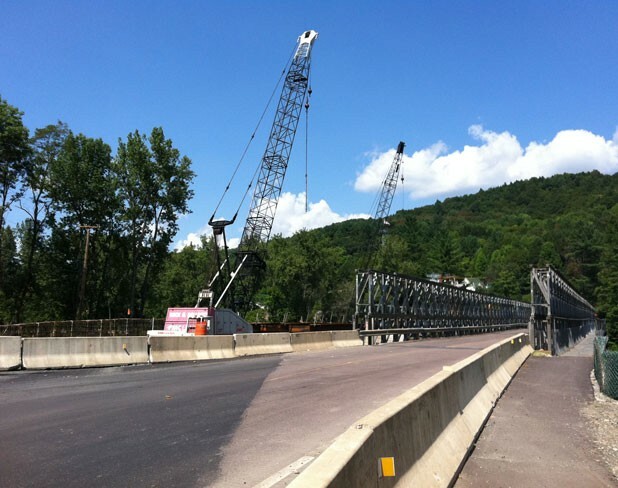 Nearby, a road crew is constructing a permanent bridge to span that once-raging waterway. But some fractures are proving more difficult to patch. In Bethel, residents are still smarting from a small-town spat that escalated into a full-blown feud in the weeks and months after disaster struck, pitting local officials against upstart volunteers. When the storm struck, small-town politics were far from the minds of Bethel residents. They were busy fighting or fleeing the rising waters. On August 28, Carla Hodgdon and her husband watched the flood hit the trailer park opposite their Pleasant Street home, then creep up their cellar stairs. The water eventually seeped through their hardwood floors, bringing filthy black slime; when they were wading through knee-high water, the Hodgdons retreated upstairs. On Gilead Brook Road, Sandy Levesque watched water rush into her basement — but “everyone had that,” she later learned, and she and her husband bailed themselves out. “What I remember most, what I will always remember most about the storm, was the sound of it,” she says. The storm made a crashing, terrible sound — “like a train running through,” agrees Hodgdon — caused by boulders and river rocks and huge trees careening along rivers and brooks swelled to five or six times their usual width. It was when the worst of the storm had passed that Bethel began to take stock. Town officials set up a temporary emergency shelter at the elementary school. Three days after the storm, town manager Del Cloud called Levesque, who’d offered to help. He asked her to come down to the newly renovated town hall, man the single telephone and set up an emergency response center. “He opened the town hall and gave me the key … and the phone started ringing,” Levesque remembers. At first she worked alone, but in between fielding phone calls, she rang up friends and neighbors. By the end of the day, they had a small volunteer corps at the ready. The volunteers set up whiteboards and began assessing the situation in town. After a week, Levesque had to get back to her regular job, so she handed over the keys to another volunteer coordinator. Levesque isn’t exactly sure what happened next — she calls it a “breakdown in communication.” During her own time with the volunteer corps, she recalls “seamless” cooperation between the volunteers and the town government. McCormack called Gov. Peter Shumlin’s office and, as the story goes, the governor arranged for the installation of additional phone lines. After that, the story keeps changing: In one version, Cloud canceled the work order. In another, it was a secretary at the town offices who nixed the phone installation. “One way or another, they never got the computers or phones,” says McCormack. Suddenly politics had entered the debate. Democrats were on one side, including McCormack and Church Street resident Ola O’Dell, an outspoken 80-year-old who has two stints in the Peace Corps under her belt. Republican town fathers were on the other, accusing McCormack and company of politicizing the disaster and stirring up controversy. Then tensions escalated even further. About three weeks after the flood, O’Dell (whose personalized license plate reads “DMOCRAT”) was working at the volunteer center when Cloud arrived at the town hall around noon. “They told us we had to be out at five o’clock,” O’Dell says — an ultimatum that left the volunteers frantically scrambling to relocate truckloads of donated goods and clothing. Cloud says the town needed the hall for a Federal Emergency Management Agency meeting place. How did this strife look to townspeople who weren’t directly involved? David Sambor owns the Bethel Village Sandwich Shop, which became a natural gathering point in the village after the storm. “People were coming out of the hills and funneling into town,” he remembers. When volunteers and outspoken residents began pushing back, onlookers say, the town fathers reacted defensively. One concern repeatedly raised by volunteers and some flood victims was that Bethel never held a town meeting of the sort that became common in neighboring towns. Cloud staunchly defends the town’s actions. Meetings were happening regularly, he says — among officials. He calls Bethel’s emergency-action plan adequate, and suggests that towns that held frequent citizens meetings weren’t facing Bethel’s degree of devastation. “We didn’t have the luxury of time,” he says. Cloud chalks up much of the “disarray” that the media documented in Bethel to individual residents, not town leadership. “A lot of the individuals failed to prepare themselves properly, despite the warnings that were issued,” he says. As for the volunteers, Cloud says town officers were grateful for their help, but some overstepped their bounds. O’Dell sighs when asked about the fallout. “I don’t think we’ll ever get over that,” she says. Bethel’s tensions were stirred up again just last week, when the selectboard tentatively decided to take FEMA funds that could have been used to rebuild a bridge on Old Route 12 and allocate them to another project, such as rebuilding the town garage. Some jaded residents say it’s the latest example of the town’s insensitivity to residents hardest hit by the storm. But both sides can agree on one thing: It’s time to move on. Bethel residents also agree that they’d like the media to stop portraying their community as a town divided. Sounds like it’s time for Bethel to pull together once more. Timely Mail, Sunday Packages: Can Burlington's Acting Postmaster Deliver?